Every summer Cedar Breaks is treated to a spectacular display of wildflowers. Early bloomers such as cushion phlox, kittentails, and aspen bluebells emerge in late June. Displays peak in mid-July as countless other wildflowers bloom: scarlet paintbrushes, Colorado columbines, little sunflowers, elkweeds, and many more fill the forests and meadows with color. Every year Cedar Breaks celebrates this colorful show with an annual Wildflower Festival. Join a specialist on a guided hike and learn all about the different wildflowers. Guided hikes are offered twice daily and meet at the Visitor Center at 10:00 am and 1:00 pm. 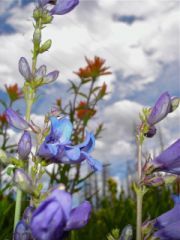 You can also pick up a common wildflower checklist or a “What’s In Bloom” handout and go on a self-guided walk. Family-friendly games and activities are available on weekends from 10:00 am to 4:00 pm in the Visitor Center area. Photography and journaling classes from Zion Canyon Field Institute are available with registration. Click hereto learn more about Zion Canyon Field Institute and its class offerings. To make the most of your experience, stop by the visitor center for updated information, maps and specially discounted wildflower lists and guides. The Ninth Annual Wildflower Festival will begin on July 5 and continue through July 20, 2014.